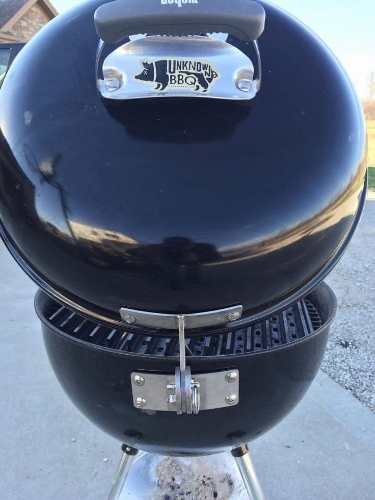 Custom 18.5″ Weber Lid Hinge w/Quick Release Pin! Tired of hunting for a place to set your Weber Kettle lid? We have the solution! An all Stainless Steel custom hinge that holds the 18.5″ model lid like a champ. These hinges are Made In The USA and ship complete with Stainless Steel hardware and mounting instructions. NOTE: This hinge is designed with a quick release pin so you can tighten or loosen the “play” of the hinge! (Patented.) Order below!